Ringgold County Public Health (RCPH) staff recently met with Mount Ayr City Superintendent Brent Wise and Mayor Don Solliday to reassess the city policies and environment as part of Community Transformation Grant (CTG) activities. Topics included in the assessment were physical activity, nutrition, tobacco use, chronic disease management and leadership. A continuation of the curb cut program started last year grew out of this reassessment. By cutting the curbs and adding detectable tile warnings, it is safer for all residents to walk in the community. 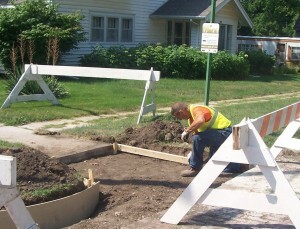 The curb cut program began in September 2012 with CTG funding following the original assessment, which also included walkability and bikeability studies. A route from the school to the city square and continuing to Judge Lewis Park was observed to be the most used by residents. This is the same route where way-finding signs with motivational messages were placed this past spring. Plans are to make all curb cuts along the route handicap accessible through this cooperative venture between the City and Public Health. Work will be complete by the end of September for use during the pleasant fall weather. Following the completion of the curb cut project, look for additional improvements that will enhance the safety of the route even more.